My journey as a fiction writer and a place for my projects, writing and otherwise. This Saturday, I attended a childcare conference as part of the in-service hours I’m required to complete for the year. 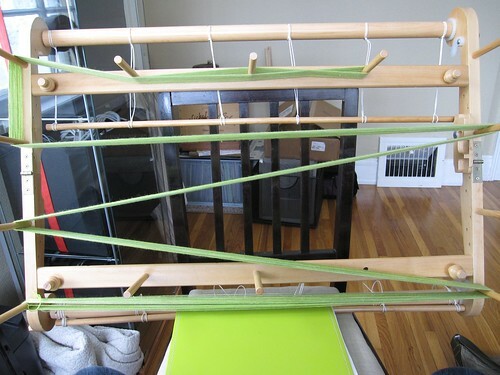 I was able to wake up early and start winding some yarn onto my Harp-as-warping-board for a couple of new scarves. After the conference, I finished the warp chains and started putting the warp onto the loom before heading off to a friend’s birthday dinner. This morning, I threaded the warp ends through the holes and started tying them onto the front beam. This is my least favorite part of warping the loom. I tie them in groups of ten, starting on the far right, then to the far left, working my way inward. I hate this part, though, because of trying to get the tension all the same. I tie everything once, then go back and fix the loose groups of yarn, and then by the time I do that, it seems that the rest have gotten loose. Today I alleviated some of my frustration by clipping my fingernails, which had gotten too long. It’s actually funny that my nails were too long, because I am normally a chronic nail biter and they were only long-ish because I’m getting better at not biting them! Anyway, tying those groups of warp ends in a bow is difficult to do without letting the yarn slip and loosen while you’re doing the bow part. But I got it done and then wove just over 51 inches of scarf today! That means one scarf is almost done, but I wound on enough warp for two. I’m exploring ways to make my weaving more efficient, since it will need to be if I want to be able to price things well for craft shows. So, because I’m doing two scarves, I’ve actually got to measure as I go! 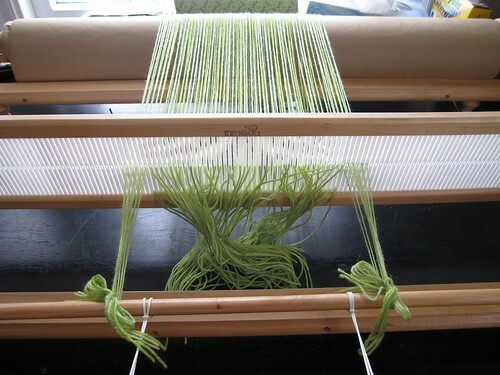 Usually I measure the warp, then weave until it runs out and hope for the best. 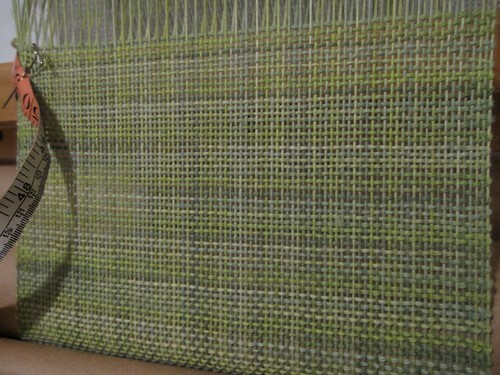 This time, I have to measure the weaving I’ve completed. It’s kind of nice, actually. It makes me feel more purposeful in what I’m doing. No crafting today, because after dinner we went shopping in preparation for a new member of our family! We’ve always wanted a dog, and then lately we started sort of talking about getting one. Tentatively. 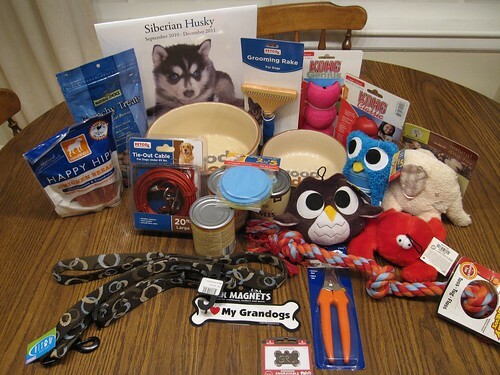 We bought a Siberian Husky book the last time we went to get cat litter. We mentioned to friends that we eventually, someday soon, might want a husky. Well, one of those friends located a husky in need. This guy was at a shelter and on his way to being euthanized. We couldn’t say no in that situation! Besides, look at that face!!! Details are still being worked out, as he is going to be transported from Alabama to Minnesota somehow. Now that the ball’s rolling, we can’t wait to have a dog in our house! The name is from the movie Despicable Me. 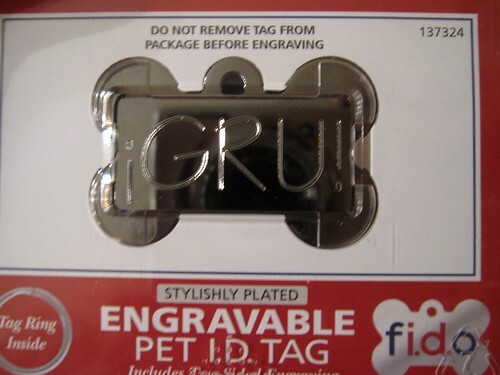 Gru is a wooly husky, which I didn’t even know existed even though we had one in our family when I was growing up. 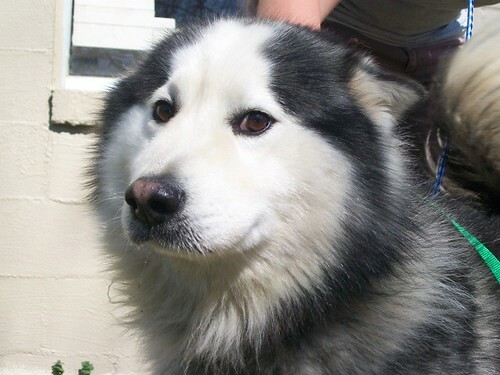 My stepmom’s dog, Jazzy, was a rescued wooly husky, but all of us assumed she was a husky mix because of her long fur. After seeing Gru described as a wooly husky, we looked it up and found out that it’s a rare coat variation that is considered a fault in purebred siberian huskies. But we don’t care. He’s so cute, and HE’S SO FLUFFY!!! I made these socks during the first week of January over the course of six days. Basically, I knitted on them every free moment I had until they were done. Why? I wanted to surprise Chris. Since I live with him, there is basically no way to surprise him with knitting. But that week, he was out of town, and I got started knitting on these the minute he pulled out of the driveway on his way to the airport. He’d picked the yarn out at Bella Lana in Minneapolis when we were there for Christmas. I’d never been to that yarn shop but my, is it gorgeously displayed! Now that I mention the yarn shop, though, I realized that I don’t know where the ball bands are for this yarn, and I don’t know the name of it! But the pattern is the pattern/sock formula that I have memorized from this set of instructions, Wendy’s generic toe-up sock pattern. My goal for the night was to finish the Summer Blooms Scarf, and I did it! 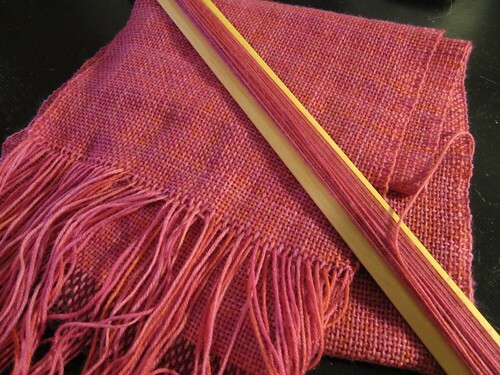 It’s off the loom, but I need to tie off the warp ends and wet finish it. However, I’m going to leave that for another day. I want to get all the sleep I can for our epic road trip tomorrow! I got the day off so that we can go see Atmosphere in Bemidji. The Atmosphere show in Duluth sold out a half hour after the tickets went on sale, so we got tickets to the show in Bemidji. Since I was able to get the whole day off work, we’re driving early and possibly going on a short hike before the show. It should be a fun, eventful day. Anyway, on to the scarf picture! It’s pinker in real life, but hopefully I can get a good picture of it in natural light that I can show off later. It’s sooo soft, even before wet finishing, so I’m excited to see what the drape is like after I finish it. 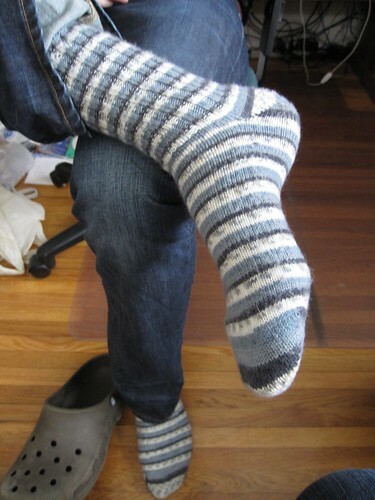 Now I want to knit socks out of the Knitpicks Stroll sock yarn! Elbow length knucks and a doggie visitor. The last couple weeks or so, we’ve had a doggie visitor stopping by our house a lot. 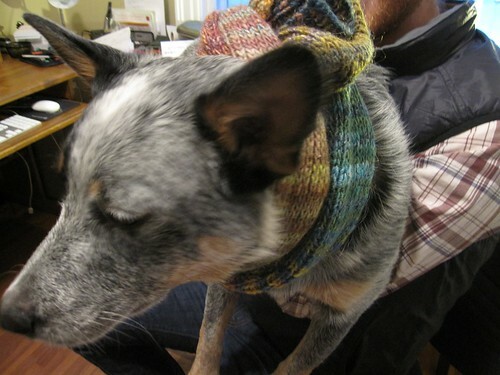 He was not too pleased when I forced knitted goods on him. My brother, however, will probably be pleased when I mail him these knitted goods that he asked for as a Christmas gift. 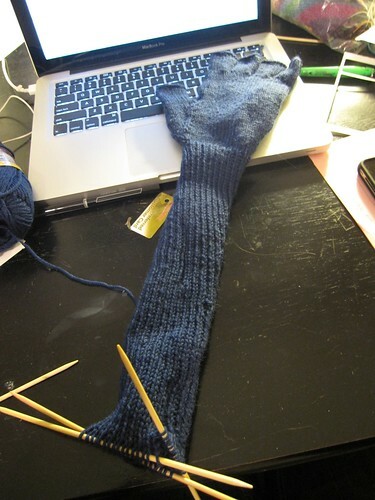 Now I just have to finish the second mitt. What to do with leftover sock yarn. 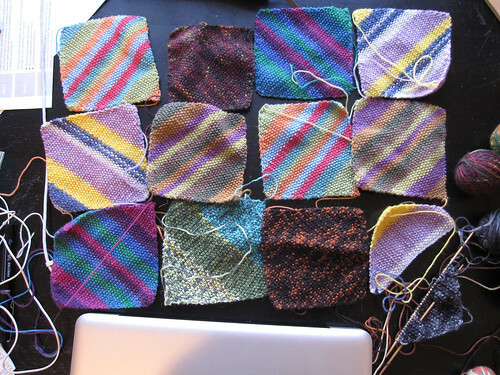 These are squares knit out of leftover sock yarn that I will eventually sew together into a quilt. Clearly I don’t have enough now, I and I likely won’t for many years, but it’ll be so cool to have a quilt that commemorates different pairs of socks I’ve knit. At the beginning of each row, KFB the first stitch. 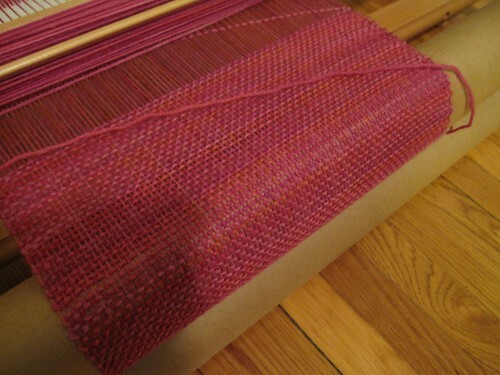 I use a seed stitch pattern, but you could do garter stitch or anything you want. Continue increasing on each row until triangle is the size you want. Now decrease at the beginning of each row until you have two sts left. Voila! An easy way to make the squares all the same size with varying yarn and needles. Here are some rather poorly lit photos of my progress on my current scarf. The yarn is Knitpicks Stroll Tonal sock yarn in the “Summer Blooms” colorway. I was looking for colors that reminded me of spring, and bright pinks definitely fit the bill. I find showing progress pictures of weaving to be less gratifying than showing progress pictures of knitting, because with weaving you can’t see all of what’s finished. It’s all rolled on the beam! So, between now and when I actually finished, there is basically no point in showing any more progress pics. It’ll all look the same. 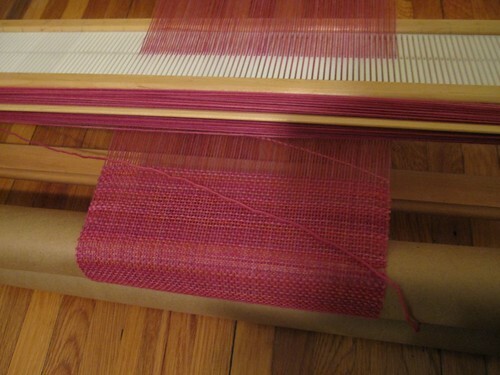 Good thing weaving on a rigid heddle loom goes so quickly!